15 ¾ inches (40 cm) deep, neckline 27 ½ inches (70 cm) and circumference at bottom edge 55 inches (140 cm). 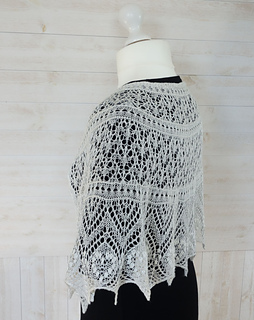 Small changes in size can be made while blocking. Yarn: 1 skein of Zitron Traumseide 100 % silk, 875 yards (800 m) / 100g. About 80 g is used. Size: 15 ¾ inches (40 cm) deep, neckline 27 ½ inches (70 cm) and circumference at bottom edge 55 inches (140 cm). 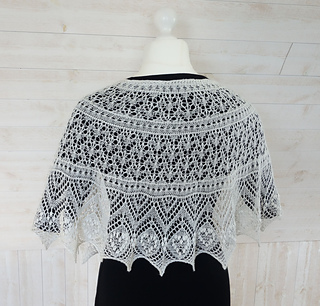 Small changes in size can be made while blocking. 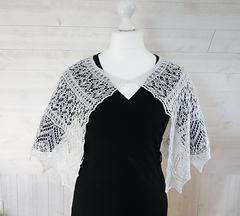 If you use heavier weight yarn and larger needles, you will get a larger capelet. Work swatch to calculate size. Needles: US 2 ½ (3 mm) circular needle or the needle you need to get gauge. Gauge: One repeat of chart A is 8 cm wide washed, blocked and relaxed. It is recommended to work the complete chart A, if you want to swatch for size. Other notions: 18 stitch markers. Crochet hook or other gizmo for placing beads. If your beads are a little irregular, using a piece of bendable fishing line or the like is a practical solution. Darning needle. Beads: Seed beads size 8/0. About 1200 beads are used. 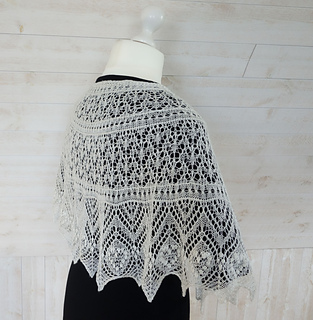 Construction: The shawl is worked in one piece from the bottom up. 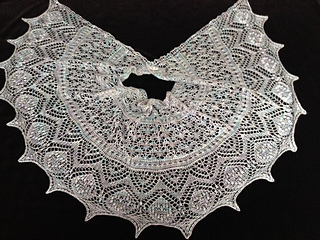 The shawl is bound off using a narrow sideways knitted on edge. 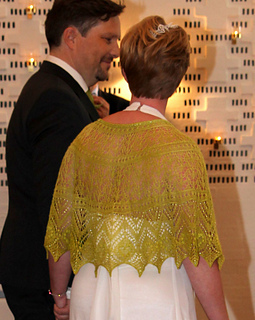 Well… My sister was getting married and of course I offered to knit her a shawl for the wedding. But my sister has two small children and felt she needed her hands free for them at the wedding, so she asked for something with sleeves instead. Sure, how about a shrug? 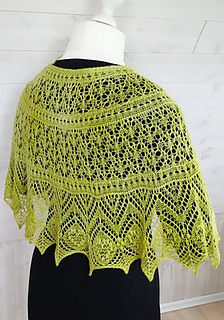 A shrug was accepted, and the colour and yarn found after much interwebs searching and discussion and mailing back and forth. It was custom dyed and took a while to get here, but we had time. Sister of course wanted everything to be PERFECT. 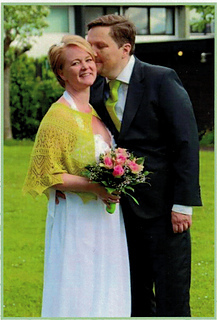 Shrug was done and sent to her for approval, some 2 months before the wedding was to take place. She loved it in general terms, but felt it was too tight in the arms. Easily fixed I thought. 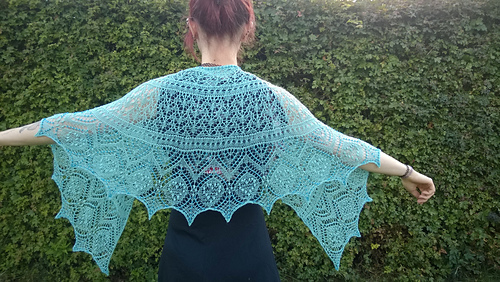 Oh, and then she really wanted a shawl after all, but one that could stay up by itself. Ah. 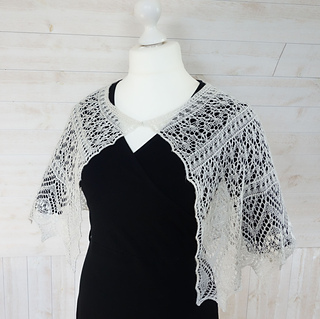 So no sleeves, but a poncho type shawl? Pictures were exchanged hectically over a couple of days, time was running a bit short I felt, and then she talked to the hairdresser who said NOTHING TO GO OVER YOUR HEAD after the hair is done. Oh… That meant no poncho type, after all. Finally, we settled on the shape you see here, with a large open neck (sis doesn’t like things that feel tight) and a button to fasten it in front. Also, it should be long enough to cover the bare back, but not too long to be a bother when sitting down. And she would like some bling-bling (later modified to rather a lot of blingbling with 1200 beads in the edge), but nothing dangling from the edge.